Because being broke shouldn't always mean feasting on raw macaroni, we rounded up three legit local chefs (who've been there before, brother) to show you how to make a day's worth of breakfast, lunch, and dinner with simple, common ingredients for just 15 total bucks, thankfully none of which are Andrew Bogut, as he's always out. 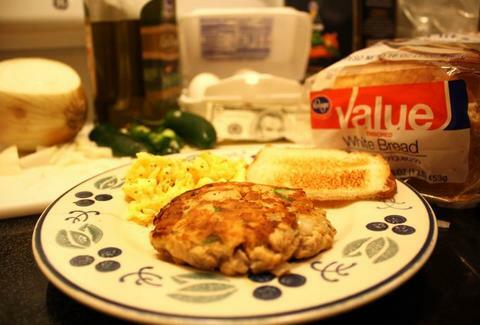 Breakfast: Salmon Cake Plate, $3.95 by Kevin "Spevin" Clark, owner/chef at Home Grown Chef Kevin's creation is a spicy jalapeno/bread-crumb'd seafood patty, and includes a side o' scrammed eggs, all of which he recommends seasoning with Old Bay, though Bay of Pigs would mean your breakfast is no longer kosher. If you don't have ketchup or jelly, "borrow" a packet from a nearby restaurant. Print this recipe card for directions. Lunch: Chorizo-Feta Sammy, $4.99 by Jessica "Jes Kos" Koslow, GM/chef at Abattoir You'll need a blender, a large, heavy skillet, and a cookie sheet to make this sando, which adds eggs to the Feta/sausage combo, which should come out as "a crumbly mix" -- so basically, if you loved your Summa Jamz '94 XLII, this is the sandwich for you. JK recommends hitting the Buford Highway Farmers Market to get it all in one place; click here for the deelish recipe. Dinner: Homeless Gumbo, $5 by Mike "Bone Lick" LaSage, sous chef at P'cheen For one low, low price, his thick, meaty soup'll actually yield four or more large servings, and includes chicken, andouille, peppers, and chicken stock, which was initially made available in a Thigh-PO. Gumbo for $5?!! Yes. See how to pull it off here.